Space Shuttle Columbia hurtles through a perfect blue Florida sky following. 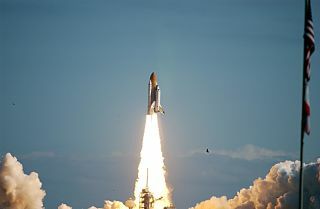 Liftoff of Columbia on mission STS-107 occurred on-time at 10:39 a.m. EST on Jan. 16, 2003. CAPE CANAVERAL, Fla. -- The space shuttle Columbia is presumed missing and the crew lost. NASA lost communication with space shuttle Columbia and the orbiter did not appear in the skies over Central Florida as expected during re-entry Saturday morning. Television views captured by a Texas station shows the shuttle breaking up. NASA last received communications with the shuttle at about 9 a.m. EST (1400 GMT) as the orbiter flew above Texas. Columbia was carrying a crew of seven astronauts: commander Rick Husband, pilot Willie McCool and mission specialists Kalpana Chawla , Laurel Clark, Mike Anderson, David Brown and Israeli payload specialist Ilan Ramon. NASA flight director Leroy Cain has put Mission Control in Houston on full contingency alert. The de-orbit burn took place as scheduled at 8:15 a.m. EST (1315 GMT) and all appeared to be going well with the re-entry until contact was lost over the north central part of Texas. No technical problems with the shuttle were reported Friday as the routine, day-before-landing checks were made. At the pre-landing news conference, entry flight director answered questions about potential damage to Columbia's heat protection tiles that might have been the result of insulating foam seen coming loose from the shuttle's external tank at launch. Cain said engineers studied the situation and were not worried. "We took a very thorough look at the situation with the tile on the left wing and we have no concerns, whatsoever," Cain said Friday. "Therefore we haven't changed anything with respect to our trajectory design." If the damage was more severe it's possible that a burn-through of some kind could trigger a catastrophic series of events.